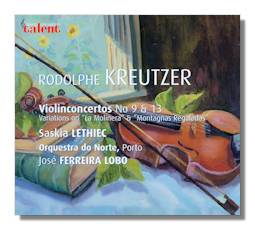 One of the primary exponents of the French school of violin, Kreutzer was able to ride out the French Revolution and subsequent chaos with barely a glitch to his career. He was famous throughout Europe as one of the great virtuosos of his age. Louis Spohr, no mean violinist himself considered him the most cultivated of the Parisian violinists, and Ludwig van Beethoven was so impressed with his playing that he dedicated his ninth violin sonata to him. Kreutzer considered Beethoven's sonata unplayable, however, and so never performed it. The early concertos show the influence of his teacher, Anton Stamitz, and of the italian virtuoso Giovanni Battista Viotti who he met in 1782, but of the 20 concertos (all composed 1801-10) the later works show an individual voice emerging. Albrecht Breuninger has also released a set of three late concertos (#15, 18 & 19) with Alun Francis and the Southwest German Radio Orchestra on CPO 777188-2.